This article is about the tropical cyclone in 2011. For other storms of the same name, see Tropical Storm Irene. Hurricane Irene was a large and destructive tropical cyclone which affected much of the Caribbean and East Coast of the United States during late August 2011. The ninth named storm, first hurricane, and first major hurricane of the 2011 Atlantic hurricane season, Irene originated from a well-defined Atlantic tropical wave that began showing signs of organization east of the Lesser Antilles. Due to development of atmospheric convection and a closed center of circulation, the system was designated as Tropical Storm Irene on August 20, 2011. After intensifying, Irene made landfall in St. Croix as a strong tropical storm later that day. Early on August 21, the storm made a second landfall in Puerto Rico. While crossing the island, Irene strengthened into a Category 1 hurricane. The storm paralleled offshore of Hispaniola, continuing to slowly intensify in the process. Shortly before making four landfalls in the Bahamas, Irene peaked as a 120 mph (190 km/h) Category 3 hurricane. Thereafter, the storm slowly leveled off in intensity as it struck the Bahamas and then curved northward after passing east of Grand Bahama. Continuing to weaken, Irene was downgraded to a Category 1 hurricane before making landfall on the Outer Banks of North Carolina on August 27, becoming the first hurricane to make landfall in the United States since Hurricane Ike in 2008. Early on the following day, the storm re-emerged into the Atlantic from southeastern Virginia. Although Irene remained a hurricane over water, it weakened to a tropical storm while making yet another landfall in the Little Egg Inlet in southeastern New Jersey on August 27. 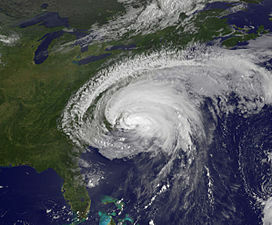 A few hours later, Irene made its ninth and final landfall in Brooklyn, New York City. Early on August 29, Irene transitioned into an extratropical cyclone while striking Vermont, after remaining inland as a tropical cyclone for less than 12 hours. Throughout its path, Irene caused widespread destruction and at least 49 deaths. Damage estimates throughout the United States are estimated near $13.5 billion, making Irene one of the costliest hurricanes on record in the country. In addition, monetary losses in the Caribbean and Canada were $830 million and $130 million respectively for a total of nearly $14.2 billion in damage. On August 15, 2011, a tropical wave exited the west African coast, and emerged into the Atlantic, characterized by distinct low-level cyclonic rotation and deep tropical humidity. It remained well-defined while moving steadily westward for several days to the south of the Cape Verde Islands, although at the time any notable convection occurred well to the southwest of its axis. As the wave distanced itself from the islands, development of thunderstorms and showers in its proximity continued to remain scarce, and it became rather broad in appearance. On August 19, the convective structure began to show signs of organization as the associated atmospheric pressure lowered, and with a progressively favorable environment situated ahead of the wave its chances of undergoing tropical cyclogenesis markedly increased. The strong thunderstorm activity continued to become more pronounced around the main low-pressure feature. By August 20, the National Hurricane Center noted that tropical cyclone formation was imminent as the wave neared the Lesser Antilles, and a reconnaissance aircraft confirmed the presence of a small surface circulation center just southwest of a burst of vigorous convection and unusually high sustained winds, indicating sufficient organization for the cyclone to be upgraded into Tropical Storm Irene at 23:00 UTC that day. Irene was positioned about 190 mi (310 km) east of Dominica in the Lesser Antilles when it was classified and named, along weakening high pressure over the west-central Atlantic, inducing a roughly west-northwestward path for most of its journey through the eastern Caribbean. Its mid-level circulation continued to become better established as hints of pronounced banding features curved north of the surface center. On August 21, the surface center reformed closer to the deepest convection; furthermore, an anticyclone aloft provided supportive outflow over the cyclone. With the improved structure, as well as light wind shear and high sea surface temperatures, Irene was forecast to strengthen to near hurricane force prior to landfall in Hispaniola. Over the subsequent day (August 22), while passing near the island of Saint Croix in the U.S. Virgin Islands, Irene traced toward Puerto Rico, more northward than initially expected, where it underwent a considerable increase in strength and organization. Hours later, Irene moved ashore, approaching from the southeast at landfall near Punta Santiago, Humacao, Puerto Rico, with estimated sustained winds of 70 mph (110 km/h). Despite the storm's interaction with land, radar imagery showed a ragged eye-like feature, and Doppler weather radar data indicated wind speeds in excess of hurricane force. Just after its initial landfall, Irene was accordingly upgraded to a Category 1 hurricane, the first of the 2011 Atlantic hurricane season. With the hurricane then situated just north of the mountainous coast of Hispaniola, the storm deepened little after reemerging over water, and any additional organization during the rest of the day was gradual. After briefly weakening on August 23, however, Irene began to develop a distinct eye encircled by an area of deepening convection the next morning. Moving erratically through the southeast Bahamas over very warm waters, Irene quickly expanded as its outflow aloft became very well established; the cyclone intensified into a Category 3 major hurricane as it recurved toward the northwest along a weakness in the subtropical ridge. The cyclone subsequently underwent a partial eyewall replacement cycle, which resulted in some reduction in its winds. Although a distinct eye redeveloped for a few hours, it obscured once again soon thereafter; Irene was unable to recover from the cycle, with no further significant intensification expected thereafter. Hurricane Irene's remnants on August 30, in the process of being absorbed by another system. Early on August 27, Irene further weakened to a Category 1 hurricane as it approached the Outer Banks of North Carolina. At 7:30 am EDT (11:30 UTC) the same day, Irene made landfall near Cape Lookout, on North Carolina's Outer Banks, with winds of 85 mph (137 km/h), but exhibited an unusually low pressure of 951 mbar, which is typically found in a category 3 hurricane. After having tracked over land for about 10 hours, the eye of Irene became cloud-filled, although the center remained well-defined on radar images. Early in the evening of August 27, Irene re-emerged into the Atlantic near the southern end of the Chesapeake Bay in Virginia as a marginal Category 1 hurricane, slowly weakening as it continued northward and weakening to a tropical storm early on August 28. Shortly before sunrise, at 5:35 am EDT (0935 UTC) on August 28, Irene made a second landfall at Brigantine in southeastern New Jersey with winds of 70 mph (110 km/h) and soon after moved over water again, hugging the New Jersey coastline. About 3 1/2 hours later, Tropical Storm Irene made landfall with 65 mph (105 km/h) winds in the Coney Island neighborhood of Brooklyn, New York. Following its final New York landfall, Irene moved northeast over New England while maintaining its strength, before it was declared an extratropical cyclone early on August 29, while its center was located near the New Hampshire/Vermont border. During that day, the system continued to move towards the northeast, before it was absorbed by a frontal system early on August 30. In response to the formation of Irene, tropical storm warnings were issued for all of the Leeward Islands and Puerto Rico. Also in the Lesser Antilles, the storm's approach prompted authorities in the U.S. Virgin Islands to close off air- and seaports, as well as to open public shelters. As Irene was forecast to make landfall on Hispaniola, a tropical storm watch was initially issued for the south coast of the Dominican Republic, though it was upgraded to a hurricane warning on August 21, after strengthening was forecast. In light of the expected intensification to hurricane status, a tropical storm warning was also issued for the northern coast fire of that country, while a tropical storm watch was put in effect for all of Haiti; the tropical storm warning for Puerto Rico was simultaneously upgraded to a hurricane watch. Later that day, all of the Dominican Republic was placed under a hurricane warning, with the tropical storm watch for Haiti upgraded to a warning and a tropical storm watch initiated for the southeastern Bahamas and the Turks and Caicos Islands. As Irene's forecast track became justified, the latter watch was upgraded to a warning on August 22, while a hurricane watch was declared for the central Bahamas. With Irene's projected path fixed over much of the United States East Coast, over 65 million people from the Carolinas to northern New England were estimated to be at risk. Due to the threat, state officials, as well as utilities, transportation facilities, ports, industries, oil refineries, and nuclear power plants, promptly prepared to activate emergency plans; residents in the areas stocked up on food supplies and worked to secure homes, vehicles and boats. States of emergency and hurricane warnings were declared for much of the East Coast, including North Carolina, Virginia, Maryland, Delaware, the District of Columbia, Pennsylvania, New Jersey, New York, Connecticut, Rhode Island, Massachusetts, Vermont, New Hampshire, and Maine. In advance of the storm, hundreds of thousands of people evacuated near coastal areas, and hundreds of shelters were prepared. Many gasoline stations in the region reported shortages due to the preparations for Irene. Six Major League Baseball games were postponed or moved to August 27 in doubleheaders, and one National Football League preseason game was postponed. The Barclays golf tournament was shortened and three Major League Soccer games were postponed. In South Carolina, Emergency Management was already on standby in Charleston and Dorchester counties in preparation for September. On August 23, preparations were also being made in Beaufort County as well. The gondolas were removed from the Myrtle Beach SkyWheel attraction in preparation for tropical-storm-force winds. In North Carolina, a mandatory evacuation order was issued on August 23, for Ocracoke Island and Hyde County. Governor Bev Perdue declared a state of emergency on August 25, with hurricane and tropical storm watches posted for the state; a mandatory evacuation was issued for Carteret County and for all tourists of Dare County, though the latter was extended to include all residents by the next day. In addition, officials urged residents at the Bogue Banks to commence evacuations by 6 am August 26, and tourists in Currituck County were advised to move inland. Seymour Johnson Air Force Base planned to move jets to Barksdale Air Force Base in Louisiana; Marine Corps Air Station Cherry Point and Marine Corps Air Station New River both evacuated their aircraft as well. Progress Energy announced on August 26, it would have 800 more line workers and 250 tree cutters ready after Hurricane Irene. Officials at UNC-Wilmington issued a voluntary evacuation and enforced a curfew in response to the storm, interrupting move-in activities. As low-level atmospheric confluence within the outer bands developed near the coast, a tornado watch was issued from north-northeast of Cape Hatteras to southwest of Wilmington. Virginia Governor Bob McDonnell declared a state of emergency in preparation for any possible effects from the hurricane along coastlines. Authorities in the cities of Norfolk, Virginia Beach, Newport News, Hampton, and Portsmouth issued voluntary and mandatory evacuations for low-lying and oceanfront areas. The city of Poquoson ordered a mandatory evacuation for all of its citizens. Public storm shelters were opened in most the cities, and officials also prepared school buildings to accommodate evacuees. By August 25, dozens of vessels at the Norfolk and Newport News shipyards began to evacuate or prepare to weather the storm, including the carriers Enterprise, Dwight D. Eisenhower, Harry S. Truman, Theodore Roosevelt, and the construction site of the Gerald R. Ford. The United States Navy ordered ships to halt their operations and clear the warning zone. Fort Monroe Army base was evacuated on August 26; Langley Air Force Base followed suit the next day, save essential personnel. Satellite image of Irene making landfall in New York City. On August 25, Maryland Governor Martin O'Malley declared a state of emergency in preparation for Irene. The town of Ocean City initiated "phase one" of its contingency plan that same day, which includes a mandatory evacuation order for international workforce students. Hours later, phase three of the plan was instituted; it ordered a mandatory evacuation scheduled to start at midnight August 25, for all residents, with the requirement that everyone be evacuated by 5 pm local time, August 26. On August 26, Dorchester and Wicomico Counties declared states of emergency. Certain geographic areas of Somerset and Wicomico Counties, along with all mobile homes in Wicomico County, had mandatory evacuation orders put in effect. Public shelters were made available in Dorchester, Somerset, Wicomico, and Worcester Counties. In Delaware, Governor Jack Markell ordered visitors to evacuate the Delaware beaches effective 6:00 pm on August 25. In addition, he declared a state of emergency; shelters were scheduled to open throughout the state on August 26. The Cape May – Lewes Ferry across Delaware Bay also suspended service for late August 27, through August 28, in response to the pending arrival of the hurricane. Toll operations on Delaware Route 1 were halted in order to optimize evacuation rates along highways. Transit services were expected to be shut down on August 27 and 28, while bridges over the Chesapeake and Delaware Canal and the Indian River were closed due to high wind. A tornado watch was issued for Delaware in association with Irene at 10:40 am August 27. In Washington, D.C., the forecast arrival of Hurricane Irene caused postponement of the planned August 28 dedication ceremony for the Martin Luther King, Jr. National Memorial. In anticipation of the storm, thousands of sandbags were prepared for placement at flood-prone Washington Metro station entrances. Amtrak service from Washington's Union Station southward was cancelled from August 26, until August 28. In eastern Pennsylvania, the ground was already saturated with water when the hurricane arrived, since the preceding month had been the wettest ever recorded. Philadelphia mayor Michael Nutter expressed concern that there could be severe devastation in the city and surrounding areas, and Governor Tom Corbett declared a state of emergency in Pennsylvania. The Southeastern Pennsylvania Transportation Authority decided to halt all commuter rail service after midnight August 28. On August 26, Philadelphia's mayor announced there would be no mandatory evacuations for the city, but urged residents to be prudent and to take action and leave should conditions warrant. Officials prepared to open three large shelters on the evening of August 27, capable of holding up to 6,000 people. The Philadelphia International Airport closed at 10:30 pm on Saturday and remained closed until Monday. In Marcus Hook, along the Delaware River, the Sunoco oil refinery preemptively lowered its production rate by 25 percent, to 140,000 barrels per day (22,000 m3/d). Grand Central Terminal stands empty following shut down of the Metro-North Railroad. In New Jersey, Governor Chris Christie declared a state of emergency on August 25, with President Obama reaffirming the declaration nationally by August 27. Mandatory evacuations were ordered for all of Cape May County and all Atlantic County shore communities east of Route 9, prompting Atlantic City's first evacuation in history. About 1,500 National Guard troops were deployed in New Jersey. One National Guard outfit was deployed to flood-prone Manville, NJ, (which was also devastated by Hurricane Floyd in 1999) A couple of National Guardsman attempted to drive two of their deep-water-capable FMTVs through the flooding, but the floodwaters were too deep. The vehicles were overtaken by the waters beneath a dipping Conrail underpass on South Main Street. The Guardsmen were photographed and videotaped by onlookers above them on the train bridge, and both photos and videos went viral over social media. Mandatory evacuations were also ordered for all of Long Beach Island in Ocean County and the Barnegat Peninsula. To relieve evacuation traffic, toll operations were temporarily suspended on the Garden State Parkway south of the Raritan River and on the Atlantic City Expressway. Residents of low-lying areas of Hudson County along the Hudson River and Upper New York Bay were advised to evacuate. Governor of New York Andrew Cuomo declared a state of emergency on August 26, and that day issued a mandatory evacuation order for low-lying areas of New York City. A day prior, New York City Mayor Michael Bloomberg had announced that the city would prepare to create "an enormous shelter system" for residents without access to higher ground. President Barack Obama issued a state of emergency declaration for the New York metropolitan area, freeing federal disaster funds, and tasking the Federal Emergency Management Agency and the Department of Homeland Security to coordinate disaster relief efforts. Cuomo deployed 2,000 National Guard troops to assist police, the Metropolitan Transportation Authority (MTA) and the Port Authority in New York and Long Island. Possible rising seawater levels from storm surge and a predicted high tide led to a complete shutdown of the MTA, the nation's largest mass transit system. All subway, bus, and commuter rail service in New York City was halted at noon on August 27. Four area hospitals began evacuating patients on August 26; sixteen nursing homes and adult care facilities were also evacuated. The New York International Fringe Festival cancelled all performances for August 27, and 28, as did all Broadway shows for those days. The United States Tennis Association cancelled special events planned for the 2011 US Open. Southern Connecticut, along the Long Island Sound, had a hurricane warning in place as of August 27, while northern Connecticut had a tropical storm warning. Governor Dannel Malloy declared a state of emergency and the state's emergency operations center was fully activated. As of 11 a.m. on August 26, about 33,000 sandbags had been distributed to state residents. Bridgeport sustained heavier damages and many parts of south Groton had numerous power outages which took weeks to get up back and running. In Rhode Island, the Army Corps of Engineers closed the Fox Point Hurricane Barrier in anticipation that the hurricane would make a direct strike on Providence. In Massachusetts, Governor Deval Patrick declared a state of emergency on August 26, activated 500 Massachusetts National Guard troops, and also planned to activate an additional 2,000 troops the following day in preparation for the storm. In an unprecedented move, the MBTA suspended all metropolitan Boston public transportation at 8:00 am on August 28. In Vermont, Governor Peter Shumlin declared a state of emergency on August 27, in preparation for the hurricane's arrival. In a joint statement, Vermont electric utilities announced that they planned to have extra staff on hand. The National Weather Service stated that it anticipated 2–5 inches (51–127 mm) of rain on the Champlain Valley and western Vermont and 3–7 inches (76–178 mm) in the Green Mountains and eastern Vermont, with the risk of flooding near streams and rivers and an anticipated sustained wind speeds of 30–45 miles per hour (48–72 km/h) and gusts of up to 45–65 miles per hour (72–105 km/h), causing significant tree damage and damage to power lines. In Maine, Governor Paul LePage declared a state of emergency on August 26, in preparation for the expected arrival of Hurricane Irene on August 28. Canadian utility and line workers were dispatched to Maine to assist in reinforcing the state's electrical infrastructure. Ten shelters were to be opened in Maine. Near Halifax, Nova Scotia, Canada, numerous large local and ocean-going vessels anchored in Bedford Basin to ride out the storm. Following its path through the northeastern Caribbean, Irene spread tropical storm conditions across all of the Leeward Islands, causing overall little damage but flooded some low-lying areas. To the south, strong thunderstorms and showers spread over Martinique, though most of the activity occurred prior to development into a tropical cyclone. In spite of the center tracking just north of Guadeloupe's island Grande-Terre, the strongest effects were brought on by Irene's outer rainbands. Tropical-storm-force winds generated brief rough seas, with peak wave heights of no more than 18 ft (5.5 m). Accompanying intermittent torrents swept through much of the territory, but overall rainfall was moderate; precipitation totals of between 3.1 and 4.7 in (79 and 119 mm) fell in Basse-Terre during the event. Due to the storm conditions, LIAT was forced to suspend all of its flights in Antigua for early August 22. Passing near the British Virgin Islands while strengthening, Irene brought gusty winds and heavy precipitation to the territory; however, resultant property damage was minimal. A lightning strike over Necker Island sparked a large fire at one of business magnate Richard Branson's resort homes, but all of its guest occupants—including British actress Kate Winslet—were able to exit the area. Irene crossed Saint Croix, U.S. Virgin Islands as a strong tropical storm on August 21, though relatively calm winds associated with the passage of its center were recorded over the island. To the north in Saint Thomas, storm conditions became progressively worse; sustained gale-force winds swept across the territory, with a gust of up to 68 mph (109 km/h) recorded at 21:20 UTC. Upon impact, the winds and inclement weather caused scattered power outages across all islands. Wide-scale assessments confirmed light damage to public schools, mostly confined to debris and leaks. Across Puerto Rico, heavy rains caused extensive damage to roads while hurricane-force winds toppled many trees and utility poles, leaving more than 1 million residences without power. President Barack Obama declared a state of emergency. About 121,000 customers were cut off from potable water service at the height of the storm, and islandwide at least 771 people had to take shelter. At higher elevations, winds estimated by radar neared 111 mph (179 km/h). The highest amounts of precipitation fell across eastern parts of the territory; in Gurabo, a peak total of 22.04 in (560 mm) was recorded. Several rivers burst their banks as a consequence of the rains, causing additional flooding. The agricultural sector also suffered losses from the storm, particularly near the location of landfall. High winds uprooted crop plants, and several coffee and banana plantations sustained minor damage. Of the plantations, the most affected were situated in Yabucoa and Maunabo, where severe flooding washed out copious amounts of banana crop. The rains continued to fall for hours into the wake of the storm, prompting the issuance of flood watches. In total, Irene affected over 1,500 people in Puerto Rico, and one driver was killed after their vehicle was caught in swollen currents. Preliminary estimates indicate structural damage could be as high as $500 million (USD), with additional losses due to the three-day labor suspensions pinned at over $60.4 million (USD). Offshore near Culebra Island, a sailboat was reported sunken due to rough seas prior to landfall in mainland Puerto Rico. Gale-force winds felled fences and shattered windows, with a flying object piercing through one residence. A total of 46 locals sought refuge to ride out the storm, but one family required post-storm shelter after the roof to their home was lost. On the island of Vieques, similar sustained winds of 51 mph (82 km/h) were recorded, as well as some gusts of up to 71 mph (114 km/h). Some power and telephone service cutoffs were reported, and the island's airport halted its operations. Skirting barely north past Hispaniola, the large storm produced gales and prolonged precipitation in the Dominican Republic, displacing over 37,700 people and leaving at least 88 communities isolated in its wake. Accompanying storm surge affected roughly 200 homes and prompted evacuations along the northern coastlines. The strongest winds also occurred in northern Cibao, where they felled multiple trees and toppled utility poles. Swollen rivers, creeks, and streams caused widespread residential flooding and damage to roads; saturated soil in the region triggered mudslides, causing additional disruptions. Despite its distance, Irene produced extreme rainfall in southern parts of the country that led to many secondary effects. Resultant floods combined with two overflown rivers swept through much of San Cristóbal, causing one bridge to collapse under the rushing waters. The flooding produced at least two drown victims in that area, both later confirmed dead. Elsewhere, another fatality occurred in Cambita Garabitos, and six others were listed as missing. Heavy rains also fell across La Altagracia Province, where one person in Higüey went missing and hundreds were evacuated. Most of the damage in the region occurred due to flooded rivers, with some agricultural losses reported. The excess surface waters overwhelmed and damaged some 170 inlets. In all, Irene affected at least 2,292 households according to preliminary reports, with 16 houses rendered beyond repair. The associated monetary losses surmounted RD$1 billion (US$30 million) in the wake of the event. In northeastern Haiti, the prolonged precipitation overflowed rivers and produced surface floods and damaging landslides across multiple road sections. About 500 residents in risk zones evacuated while some sought shelter, but only one of more than 160 evacuation sites required usage. Rough surge produced high coastal flooding, with some reports of thousands of damaged homes. In the vicinity of Port-au-Prince, brisk winds blew down many refuge tents home to victims from the major January 12, 2010 earthquake. Overall, officials indicated impact was less severe than initially feared; the storm only left isolated flood damage in its wake, particularly throughout northern parts of the country. However, two people lost their lives after being caught in swollen rivers, and four others suffered injuries. As Irene was tracking through the Bahamas, the outer bands of the storm dropped light rainfall in eastern Cuba. The cities of Moa and Sagua de Tánamo in Holguín Province reported 2.36 in (60 mm) of rain. However, the average rainfall throughout the Holguín Province did not exceed 0.20 in (5.1 mm). Some damage occurred throughout Guantánamo Province, where rough surf and rains caused flooding in Baracoa. In addition, waves of 10 to 12 feet (3.0 to 3.7 m) high were seen in Gibara, Holguín, on Wednesday 24, when Irene's eye was located between Acklins and Crooked Islands, Bahamas, just 178 miles (286 km) northeast of the city. The strong waves, combined with high tide, caused a slight coastal flooding. Turks and Caicos: On August 24, Irene passed over the British Overseas Territory of Turks and Caicos Islands at Category 1 strength. The hurricane produced high winds that blew off roofs and downed power lines throughout the territory. In Cockburn Town, residences reported loss of power, and light poles were toppled. Many homes on Grand Turk Island also reported a loss of electricity during Irene's passage, although structural damage in the area was limited. The strongest of the rains and gusts occurred in Providenciales, where light wind damage was reported to roofs and resorts. The Grand Turk cruise port also sustained some minor damage from the storm, but operations resumed three days after impact. Bahamas: A major hurricane, Irene trekked right through the Bahamas, with its eye making landfall on several of the islands. A peak wind gust of about 140 mph (230 km/h) was recorded at the height of the storm, and localized heavy rains of up to 13 inches (330 mm) fell in the area. The extreme winds damaged at least 40 homes on Mayaguana Island, and dozens of homes on Acklins were completely obliterated. On the latter island, the hurricane reportedly wiped out 90 percent of the Lovely Bay settlement. Similar winds tore off the roof and shattered the windows out of a high school on Crooked Island, where wind gusts as high as 99 mph (159 km/h) were reported. As well, a local church on the island partially collapsed due to the storm. The worst of the destruction occurred in Cat Island, characterized by widespread shattered glass and torn houses. In all, the storm caused "millions of dollars" worth in structural damage on the island, and left many homeless. Across New Providence and Grand Bahama, only limited impact occurred as Irene remained well offshore; businesses operations were scheduled to return to normal shortly after the storm. Nationwide, the damage was estimated at $40 million. Despite the overall extensive structural damage inflicted, there were no reports of fatalities on the islands in the wake of disaster. Gales from Irene affected nearly all of the Eastern Seaboard, extending from Florida to New England and as far inland as central New York and central Pennsylvania, affecting all or large parts of 15 states and the District of Columbia. The winds, combined with soil saturation due to the extreme amounts of precipitation in many of the impacted areas both from Irene and from previous thunderstorms, uprooted countless trees and power lines along the storm's path. Roughly 7.4 million homes and businesses lost electrical power, with approximately 3.3 million still without power as of August 30, three days after landfall. Coastal areas suffered extensive flood damage following its potent storm surge, with additional freshwater flooding reported in many areas. The storm spawned scattered tornadoes, causing significant property damage as evidenced by destroyed homes. In the northeastern region, more than ten rivers measured record flood heights at their hydrographs. Rivers in at least six Northeastern states reached hundred-year flood levels, while the flooding in Greene County, New York was described as five-hundred-year-flood conditions. Flooding in Schoharie County, New York was also reported by the National Weather Service in Albany, New York as five-hundred-year-flood conditions. Throughout its path in the contiguous United States, Irene caused approximately $13.5 billion (2011 USD) in damage and 47 deaths. Though Irene spared Florida from a direct hit, its outernmost rainbands produced squalls and intermittent torrents along the state's eastern coastlines. Brisk winds produced scattered power outages[not in citation given] and waves reaching as high as 12 ft (3.7 m); rough surf in the Boynton Inlet injured at least eight people, and two surfers were killed offshore Volusia County. Elsewhere, in Lantana, large waves sweeping over seawalls went on to destroy a lifeguard tower. Localized beach erosion was also reported, although it was not significant. Onshore, comparatively light winds brushed the state; the Lake Worth pier reporting a peak gust of 40 mph (64 km/h), with the Palm Beach International Airport recording winds of no more than 31 mph (50 km/h). Precipitation in the area was also light, with a peak accumulation of 2.67 inches (68 mm) recorded at Fort Lauderdale Executive Airport. Further north, rainfall from the storm totaled no more than 1.31 inches (33 mm) on August 24 in Melbourne. Owing to its unusually large windfield, Irene affected long stretches of South Carolina coastlines with gusts and sporadic heavy showers, even though it remained offshore. Gale-force winds picked up through the Lowcountry during the afternoon of August 26, with a gust of 55 mph (89 km/h) measured at a coastal marine observing site on Folly Island. Scattered power outages left over 4,000 residences in the dark, mostly due to toppled utility poles. The winds also felled trees and generated rough surf along Charleston County coastlines, and minor beach erosion was noted. Elsewhere in that county, a downed tree trapped several people in their vehicle, but they were all rescued. Tropical-storm-force winds began to affect the Outer Banks hours before landfall, producing waves of 6–9 ft (1.8–2.7 m). In addition to the gales, Irene spawned several tornadoes early on August 27, while approaching the coast. No regular weather station or buoy, however, measured sustained hurricane-force winds from the storm, with the highest winds officially recorded at 67 mph (108 km/h) by a buoy near Cape Lookout. Precipitation totals from Irene in the region were particularly high, ranging between 10–14 inches (250–360 mm); Bunyan recorded a peak amount of approximately 14 inches (360 mm). The large hurricane left extensive damage in its wake and produced tornadoes that damaged homes and overturned vehicles. Following the touch down of a potent tornado, at least four homes were demolished in Columbia, while up to three others sustained significant damage. The hurricane caused multiple flooded areas and uprooted trees along coastlines; in Nash County, a snatched tree limb struck and killed one person. Prior to the storm, a resident in Onslow County suffered a fatal heart attack while applying plywood to his house. Two people in Pitt and Sampson Counties were additionally killed by falling trees, as were two others in Goldsboro and Pitt County in traffic accidents. A man also drowned in the flooded Cape Fear River. In all, over 1,100 homes were destroyed. The estimated $71 million in damage did not include agricultural losses. Hurricane Irene cut several breaches across North Carolina Highway 12 on Hatteras Island, isolating the island from the rest of the Outer Banks. Several of the smaller breaches were filled in with sand, but the largest, which is 200 feet (61 m) wide, was left open, recreating Pea Island for the first time since 1945. As a result, the only way to access Hatteras Island was by ferry. On October 10, 2011, a temporary 662-foot-long (202 m) bridge opened over the breach. The bridge could be in place for more than 10 years while other solutions are considered. The path of the hurricane was thought by many to be the worst-case scenario for the Outer Banks, just east over the Pamlico Sound. The storm winds pushed the water rushing into the sound in the form of rainfall back up the rivers feeding the sound and when the hurricane passed the water rushed back out causing historic flooding along the Outer Banks in particular in the towns of Waves, Rodanthe and Salvo. The flood caused major damage to the area that can still be seen in Mirlo Beach at the north end of Rodanthe. Flood waters exceeded seven feet in many locations and destroyed many houses and businesses. Radar image of the storm at landfall in the Outer Banks of North Carolina. Irene over North Carolina on August 27. The astronauts on board the ISS captured this series of still frames as Hurricane Irene, a category 1 storm at the time, made landfall into the coast of North Carolina. A tornado moved through the Sandbridge community in Virginia Beach, in the morning hours of August 27, ripping the roofs off at least five homes and damaging several others. High winds in Newport News knocked a tree into an apartment complex. Three other Virginians in Brunswick, Chesterfield and King William Counties were also killed by falling trees. Most severe damage consisted of many downed trees on power lines, cars, homes, and roads; and flooding in many low-lying roads and neighborhoods – 1.2 million homes and businesses lost power due to Irene. Hurricane Irene caused widespread power outages in Delaware, Maryland, New Jersey, Pennsylvania, and Washington, D.C.
A Lexus RX450h damaged by a fallen tree in Washington, D.C.
Dorchester General Hospital in Cambridge was evacuated after there was wind and water damage to the laboratory roof. In Queen Anne's County, Maryland, an 85-year-old woman was killed when a tree fell onto her house causing the chimney to collapse. Farm fields on the Eastern Shore of Maryland were saturated with water after the storm, causing farmers to hand-pick their crops. Some tomato, corn, and cantaloupe crops were destroyed. Two 25-year-old men were killed in the Hockessin area in an apparent drowning after attempting to run home through the storm on Saturday night. Their bodies were recovered near Wilmington on Monday afternoon. An EF1 tornado touched down in Lewes, at 6:38 pm, causing a path of destruction 80 yards wide and 3/4 of a mile long, damaging about 50 homes and destroying one. Heavy rains throughout the state were topped at 10.43 inches (265 mm) in Ellendale. Flooding occurred in many areas including the Delaware Bay communities of Slaughter Beach, Primehook Beach, and Broadkill Beach. Sections of Prime Hook Road leading to Primehook Beach were washed out. Irene flooded and forced the closure of Delaware Route 1 near the Indian River Inlet Bridge, pushing sand onto the road. Five people were killed in Pennsylvania: three died as a result of fallen trees, one was killed in a traffic accident, and a woman was swept away by flooding in the Wissahickon Creek. In Philadelphia, the storm left thousands without power. More than 400 trees fell in Philadelphia, and 200 trees fell in Pittsburgh, seven buildings collapsed and twenty roads were closed. PECO worked on restoring power by mid-week. While the storm made landfall next to Galloway and Little Egg Harbor in the southeastern part of the state, South Jersey received little damage and flooding. Further north, severe river flooding occurred due to record rainfall, with a statewide rainfall maxima of 11.27 inches (286 mm) in Freehold. Eleven rivers reached record levels, and a week after the storm all rivers in the state remained at "moderate flooding level". The flooding affected roads, including the heavily used Interstate 287 and Garden State Parkway. Along the Hudson River, floodwaters affected parts of Jersey City and Hoboken. The north tube of the Holland Tunnel was briefly closed. Flooding affected the train lines in the Trenton area. The storm killed seven people in the state, and damage was estimated at around $1 billion. In addition to major flooding, the combination of already heavily saturated ground from a wet summer, and heavy wind gusts made New Jersey especially vulnerable to wind damage, notably in Union County. Fallen trees blocked vital roads, including portions of New Jersey Route 28 and U.S. Route 22. Numerous homes suffered structural damages from the wind. In total, approximately 1.46 million customers of JCP&L and PSEG throughout most of the 21 counties lost power. On Sunday September 5, power had been returned to last remaining 2,000 residents who suffered a power outage. Flooding in some parts of the state continued for another three days. On August 31, Paterson counted 6,000 displaced persons, and three of four bridges crossing the Passaic River remained closed. On August 31, President Barack Obama declared the state a disaster area, including all 21 counties. More than 31,000 residents filed assistance claims through FEMA, and within two weeks nearly $38 million had been disbursed with others pending. Hardest-hit counties were Bergen and Passaic in the northeast, each with more than 4,000 claims. Despite the mandatory evacuations ordered for many parts of the Jersey Shore, the damage and flooding in that area of the state was not as severe as predicted. This miscalculation was met with frustration among many coastal residents that were evacuated out of an abundance of caution. A year later, when evacuations were ordered for Hurricane Sandy, some residents were reluctant or skeptical about the storm's potential and their preparations were more lax, since some of Irene's impacts fell short of the original predictions. This proved very damaging for some, as Hurricane Sandy ended up being far worse than predicted. In Manhattan, the Hudson River flooded in the Meatpacking District. Long Beach and Freeport, both of which experienced serious flooding, were among the worst-hit towns on Long Island, and many roads were left impassable. The workers at Ground Zero in Lower Manhattan worked to make the World Trade Center site hurricane proof, and escaped major damage, just missing the tenth anniversary of 9/11. The winds knocked down many trees and power lines, leaving almost 350,000 homes and businesses without power in Nassau and Suffolk counties. Flooding of the Ramapo River and more than a half-mile (1 km) of washouts led both Metro-North and NJ Transit to suspend service on the Port Jervis Line north of Suffern for nearly three months. Flooding overwhelmed several sewage treatment plants, since many of them collect and processed storm runoff as well as wastewater. At least 52 municipalities in the Hudson Valley reported raw-sewage spills into local waters. Vaccinations against tetanus and hepatitis were offered to rescuers before entering houses in some areas. Parts of Washingtonville were under 8 feet (2.4 m) of water during the storm due to the flash flood of Moodna Creek, wrecking some nearby homes. Disastrous flash floods occurred in the northwestern Catskill Mountains. Record flooding along the Schoharie Creek destroyed the 156-year-old Old Blenheim Bridge, a National Historic Landmark. Flooding by Schoharie Creek in the town of Prattsville, NY caused major damage and destroyed large areas of the town. Every structure on the strip that comprises Main Street was partly or fully destroyed, including all 22 of the town's businesses. Eleven houses collapsed in the flood, fifteen were condemned and torn down, and more than 100 homes were so damaged that the residents couldn't return to them, but amazingly there were zero fatalities. It received widespread national news coverage because the town had nearly been washed away. Gov. Andrew M. Cuomo labeled Prattsville as the place in New York State hardest hit by the storm. Local officials estimated that approximately one-third of all the houses and businesses in the village of Schoharie had been destroyed due to flooding. The Gilboa Dam, built in 1926, which had undergone some strengthening procedures during 2005 and 2006, sustained minor damage due to the flooding of the Schoharie Creek. Further upstate, Irene did significant damage in the Adirondack Mountains. A section of NY 73 was washed out, isolating two hamlets. DEC reported that "landslides too numerous to count" had taken place on many of the High Peaks themselves, all of which are located on state Forest Preserve land. Overall, there were ten deaths in the state, most due to flooding. On September 3, Governor Cuomo announced the creation of a $15 million federal relief fund to help farmers there cope with the damage, after an estimated $45 million in crop damage on 145,000 acres (59,000 ha). In mid-September, farmers reported a smaller-than-average harvest of pumpkins in the northeastern United States. Many farmers in the Black Dirt Region were near bankruptcy by that point, and fundraisers were being held to tide them over pending federal disaster relief. Farmers were worried the reports would deter tourists from visiting farm country for traditional autumn activities and purchases, an economic setback which some said would exacerbate the damage from the storm. Many planned to remain open and offer what they could to visitors. Storm surge flooding in Centerport, New York as the eye of Irene passed near high tide. In Connecticut, 20 homes in East Haven were destroyed and five others were damaged beyond repair by flooding and storm surge along the shore of Long Island Sound. On Sunday, Connecticut's two main electric companies, Connecticut Light and Power and United Illuminating, reported that a record 754,000 customers, about half the state, were without power. More than two days after the storm made landfall, about 400,000 people were still without power, some being told they would have to wait more than a week, especially in heavily wooded areas. In Ridgefield, 90% of houses lost power, requiring the utility to turn off power to the other 10% to ease restoration efforts. Route 15, one of the state's main highways, was closed from the New York state line to Interstate 91 in Meriden due to fallen trees. Governor Dannel Malloy said Hurricane Irene was responsible for a tenth death on August 28: a man who died in a fire likely caused by downed wires from high winds. An elderly woman, who resided in Prospect, died in similar situations, when a falling tree caused power lines to collapse onto her home, starting a fire; her husband was critically injured. In Bristol, a man drowned when his canoe capsized. A week later, many homes in Connecticut still had not had their power restored. Connecticut Light & Power said on September 2 that it was ahead of where it expected to be, and that less than 100,000 customers would still be without power by midnight the next day. Crews had come from many distant places in North America, including British Columbia, to help the utility's own crews. The continued outages also meant that in rural areas with private wells, residents still lacked running water a week after the storm. In Massachusetts, damage was greatest in the Hill Towns and Western Massachusetts as the eye of the storm tracked westward, toward Albany, New York. High winds toppled trees and heavy rain caused widespread flooding of Connecticut River tributaries. The Westfield River rose almost twenty feet in a matter of hours; the Deerfield River rose over fifteen feet in the same period. Both rivers reached flood stages not seen since the 1955, and 1938, hurricanes and floods. A 6-mile stretch of Route 2 from Charlemont to Florida along the Cold River branch of the Deerfield was closed due to damage for over 3 months. A public works employee was electrocuted by downed power lines in Southbridge. A dam failure was mistakenly reported in East Becket, yet 200 people were evacuated as a precaution. Two trees toppled by Irene in coastal Massachusetts. Rhode Island had gusts of wind up to 71 mph (114 km/h), uprooting trees and causing extensive damage to its power grid. By the storm's end, an estimated 256,000 out of 480,281 customers were without power. Rhode Island electric company, National Grid, expected it to take until Labor Day weekend to restore power to the most remote areas and areas which were most damaged. On August 30, two days after the storm, 138,000 customers remained without power. A power line on Aquidneck Island near Portsmouth was felled by winds during the morning of August 28, severing power to Portsmouth, Middletown, Newport and Jamestown. Power was not fully restored to Aquidneck Island and Conanicut Island communities until August 30. The storm surge into Narragansett Bay caused some coastal damage, although Providence, at the head of the bay, was spared downtown flooding in part due to its hurricane barrier. There was some localized river flooding, however being on the eastern side of the storm, most of the damage came in the form of wind. Almost every river and stream in Vermont flooded, resulting in at least three deaths and one missing. In Wilmington, the flood level of the Deerfield River east branch reportedly exceeded levels measured during the 1938 New England hurricane – the only other tropical cyclone to make a direct hit on Vermont in the state's recorded history. Throughout Vermont, numerous covered bridges, many over 100 years old, were damaged or destroyed. Extensive road damage resulted in the isolation of over a dozen rural towns that would require helicopter air-lifts of necessities in the days immediately following the storm. The storm decimated multiple sections of U.S. Route 4 between Rutland and Quechee, making east/west travel through the southern part of state nearly impossible. The resort town of Killington as well as neighboring Pittsfield were completely isolated from travel in and out for two weeks. Statewide, the cost of repairs for road and bridge damage alone was estimated to exceed $700 million. Relief concerts were organized by local Vermont bands such as Phish and Grace Potter and the Nocturnals. By December the state was recovering more quickly than originally expected. Within a month of the storm 84 of 118 closed sections of state highway, and 28 of 34 bridges, had been reopened. The state had relied on assistance from National Guard units in eight other states, and highway workers lent to it by New Hampshire and Maine. "We'll do the work and we'll figure out how we're paying for it," said deputy state secretary of transportation Sue Minter, "but we're not waiting." Repair costs ultimately turned out to be $175–200 million, with most of it covered by federal disaster relief. Damage caused by flood waters on the White River to the Royalton, Vermont bridge. Tropical storm conditions occurred throughout the state of Maine during Irene's passage. Flooding caused by Irene's heavy rainfall washed out two bridges on State Route 27 in Carrabassett Valley. Irene also affected a large section of Canada, stretching from the eastern Ontario to the coasts of Newfoundland and Labrador. On August 28, in Quebec, high winds (more than 110 kilometres per hour (68 mph) in some places) and heavy rainfall from post-tropical storm Irene knocked out power to over 250,000 homes, felled tree branches, and damaged buildings and traffic signals across Montreal. One person was killed after a road was washed out and cars were swept into the Yamaska River near Sorel-Tracy; another section of road in Charlevoix was also washed out, while flooding forced evacuations in Estrie. In New Brunswick, many trees fell in the wake of the hurricane, mainly due to the strong winds associated with the storm. Power was lost to an estimated 75,000 – 200,000 New Brunswick residents, directly due to the gale-force winds. Insured damage in Canada was estimated at $130 million. Described as "A photographic scavenger hunt set to a hurricane", Wikipedia Takes Montreal was held August 28, coinciding with the hurricane. Owing to the high death toll and extensive damage wrought by the storm, the name Irene was later retired by the World Meteorological Organization, and will never again be used for an Atlantic tropical cyclone. It was replaced for the 2017 season with Irma. Direct Relief, a disaster relief organization, among many other organizations, collaborated to offer assistance for people affected by Irene. ^ Fieser, Erza (August 25, 2011). "Hurricane Irene barrels toward US as Caribbean islands take stock of damage". The Christian Science Monitor. Retrieved September 20, 2011. ^ Telling the Weather Story (PDF) (Report). Insurance Bureau of Canada. June 4, 2012. Archived (PDF) from the original on July 19, 2015. Retrieved July 19, 2015. ^ Walton, Corey (August 15, 2011). "Tropical Weather Discussion". National Hurricane Center. Retrieved September 20, 2011. ^ Walton, Corey (August 16, 2011). "Tropical Weather Discussion". National Hurricane Center. Retrieved September 20, 2011. ^ Cangialosi, John (August 18, 2011). "Graphical Tropical Weather Outlook". National Hurricane Center. Retrieved September 20, 2011. ^ Tichacek, Michael (August 19, 2011). "Tropical Weather Discussion". National Hurricane Center. Retrieved September 20, 2011. ^ Beven, Jack (August 20, 2011). "Graphical Tropical Weather Outlook". National Hurricane Center. Retrieved September 20, 2011. ^ a b Blake, Eric; Brennan, Michael (August 20, 2011). "Tropical Storm Irene Special Discussion Number 1". National Hurricane Center. Retrieved September 24, 2011. ^ Blake, Eric; Brennan, Michael (August 20, 2011). "Tropical Storm Irene Discussion Number 2". National Hurricane Center. Retrieved September 24, 2011. ^ Stewart, Stacy (August 21, 2011). "Tropical Storm Irene Discussion Number 1". National Hurricane Center. Retrieved September 24, 2011. ^ Pasch, Richard (August 21, 2011). "Tropical Storm Irene Discussion Number 4". National Hurricane Center. Retrieved September 24, 2011. ^ Brennan, Michael (August 21, 2011). "Tropical Storm Irene Intermediate Advisory Number 5A". National Hurricane Center. Retrieved September 24, 2011. ^ Brennan, Michael (August 21, 2011). "Tropical Storm Irene Discussion Number 6". National Hurricane Center. Retrieved September 24, 2011. ^ Stewart, Stacy (August 22, 2011). "Tropical Storm Irene Tropical Cyclone Update". National Hurricane Center. Retrieved September 24, 2011. ^ Stewart, Stacy (August 22, 2011). "Hurricane Irene Discussion Number 7". National Hurricane Center. Retrieved September 24, 2011. ^ Avila, Lixion (August 22, 2011). "Hurricane Irene Discussion Number 9". National Hurricane Center. Retrieved September 24, 2011. ^ Brennan, Michael (August 22, 2011). "Hurricane Irene Discussion Number 11". National Hurricane Center. Retrieved September 24, 2011. ^ Brown, Daniel (August 23, 2011). "Hurricane Irene Discussion Number 14". National Hurricane Center. Retrieved September 24, 2011. ^ Pasch, Richard; Kimberlain, Todd (August 24, 2011). "Hurricane Irene Discussion Number 16". National Hurricane Center. Retrieved September 24, 2011. ^ Brown, Daniel (August 24, 2011). "Hurricane Irene Discussion Number 18". National Hurricane Center. Retrieved September 24, 2011. ^ Masters, Jeff (August 26, 2011). "Irene's eyewall collapses; further intensification unlikely". Weather Underground Blog. Retrieved August 26, 2011. ^ Beven, Jack; Brennan, Michael (August 27, 2011). "Hurricane Irene Intermediate Advisory Twenty-Seven B". National Hurricane Center. Retrieved August 27, 2011. ^ Brown, Daniel (August 27, 2011). "Hurricane Irene Intermediate Advisory Twenty-Eight A". National Hurricane Center. Retrieved August 27, 2011. ^ Brown, Daniel; Franklin, James (August 27, 2011). "Hurricane Irene Discussion Number 30". National Hurricane Center. Retrieved August 27, 2011. ^ a b Stewart, Stacy; Berg, Robbie (August 27, 2011). "Hurricane Irene Advisory Number Thirty-A". National Hurricane Center. Retrieved August 27, 2011. ^ "Tropical Cyclone Report - Hurricane Irene" (PDF). National Hurricane Center. December 14, 2011. Retrieved September 22, 2014. Irene then continued north-northeastward, just offshore of the Delmarva peninsula, and made another landfall very near Atlantic City, New Jersey, at Brigantine Island, at 0935 UTC 28 August. Although Irene's intensity at the New Jersey landfall was 60 kt, winds of that strength were confined to the waters east of the track of the center. ^ a b c d e f g h Avila, Lixion A; Cangialosi, John (December 14, 2011). Tropical Cyclone Report: Hurricane Irene: August 21 – 28, 2011 (PDF). National Hurricane Center (Report). United States National Oceanic and Atmospheric Administration's National Weather Service. Archived (PDF) from the original on November 27, 2012. Retrieved July 19, 2015. ^ Blake, Eric; Brennan, Michael (August 20, 2011). "Tropical Storm Irene Advisory Number One". National Hurricane Center. Retrieved August 22, 2011. ^ a b Blackburn, Joy; Shea, Daniel (August 22, 2011). "Irene's eye crosses St. Croix". The Virgin Islands Daily News. Times-Shamrock Communications. Archived from the original on August 26, 2011. Retrieved August 23, 2011. ^ Blake, Eric; Brennan, Michael (August 21, 2011). "Tropical Storm Irene Advisory Number Two". National Hurricane Center. Retrieved August 21, 2011. ^ Stewart, Stacy (August 21, 2011). "Tropical Storm Irene Advisory Number Three". National Hurricane Center. Retrieved August 21, 2011. ^ Pasch, Richard (August 21, 2011). "Tropical Storm Irene Advisory Number Four". National Hurricane Center. Retrieved August 21, 2011. ^ Pasch, Richard (August 21, 2011). "Tropical Storm Irene Advisory Number Six". National Hurricane Center. Retrieved August 21, 2011. ^ "65 million people on East Coast await Hurricane Irene's wrath". MSNBC. August 26, 2011. Archived from the original on August 26, 2011. Retrieved August 26, 2011. ^ Reuters staff (August 25, 2011). "US East Coast in Irene's path, scrambles to prep". Reuters. Archived from the original on August 26, 2011. Retrieved August 25, 2011. ^ a b c d e f g Bauerlein, Valerie (August 26, 2011). "U.S. East Coast Braces as Irene Batters Bahamas". The Wall Street Journal. Retrieved August 25, 2011. ^ a b c Hendrix, Steve (August 26, 2011). "East Coast braces for Hurricane Irene; warning area expanded". The Washington Post. Retrieved August 26, 2011. ^ a b "Gov. Markell declares state of emergency". The News Journal. August 25, 2011. Archived from the original on August 26, 2011. Retrieved August 26, 2011. ^ Craig, Tim (August 26, 2011). "D.C. declares state of emergency as Hurricane Irene approaches". Washington Post. Retrieved September 20, 2011. ^ Rubkinam, Michael. "Pa. gov declares state of emergency as Irene looms". WHTM-TV. Retrieved September 8, 2011. ^ a b Holthaus, Eric (August 26, 2011). "Waiting for Irene: What to Expect When the Storm Arrives". The Wall Street Journal. Archived from the original on August 26, 2011. Retrieved August 26, 2011. ^ "Governor Lincoln D. Chafee Issues Declaration of Disaster Emergency" (Press release). Rhode Island. August 26, 2011. Archived from the original on August 26, 2011. Retrieved August 26, 2011. ^ "Gov. Patrick declares state of emergency ahead of Hurricane Irene". Boston Herald. Associated Press. August 26, 2011. Archived from the original on August 26, 2011. Retrieved August 26, 2011. ^ a b "VT Governor declares State of Emergency Archived January 8, 2014, at the Wayback Machine" (August 27, 2011). WCAX-TV. ^ a b c "Live blog: Irene's winds 'extremely dangerous' at 105 mph". CNN. August 26, 2011. Retrieved August 25, 2011. ^ a b c Mueller, Tim (August 27, 2011). "Maine under state of emergency; Canadian utilities sending workers". Portland Press. Retrieved August 27, 2011. ^ "Irene bringing gasoline shortages, power outages". The Wall Street Journal. Associated Press. August 27, 2011. Archived from the original on August 26, 2011. Retrieved August 26, 2011. ^ Jackson, Scott (August 26, 2011). "Update: Irene forces Saturday Sox-A's doubleheader". Bleacher Bum Sports. Retrieved August 26, 2011. ^ "Clubs take precautions in advance of Irene". MLB.com. August 27, 2011. Retrieved August 27, 2011. ^ "Jets-Giants game moved to Saturday afternoon". The New York Post. August 25, 2011. Retrieved August 26, 2011. ^ a b c d e "Live blog: New York, Philadelphia, New Jersey to halt transit services". CNN. August 26, 2011. Retrieved August 26, 2011. ^ Bell, Jack (August 25, 2011). "Friday Update: M.L.S. Postpones 3 Games". The New York Times. Retrieved August 26, 2011. ^ a b "FEMA: Entire east coast should prepare for Hurricane Irene". CNN. August 23, 2011. Retrieved August 22, 2011. ^ "Breaking News: Evacuation Orders For Ocracoke". WITN. Associated Press. August 23, 2011. Retrieved August 26, 2011. ^ "Emergency Management Bulletins (Dare County, NC)". Dare County Government. August 26, 2011. Archived from the original on October 6, 2011. Retrieved August 26, 2011. ^ a b c "More flee ahead of Irene as track forecast shifts". MSNBC. August 26, 2011. Archived from the original on August 26, 2011. Retrieved August 25, 2011. ^ "Hurricane Irene has NC base ready to move jets". MSNBC. August 24, 2011. Retrieved August 25, 2011. ^ Hodge, Hope. "New River aircraft evacuate in preparation for Irene". ENCToday.com. Archived from the original on October 4, 2011. Retrieved August 27, 2011. ^ "UNCW issues voluntary evacuation and curfew". WECT.com. August 5, 2011. Retrieved August 21, 2013. ^ Corfidi, Steve (August 26, 2011). "Tornado Watch 809". Storm Prediction Center. Archived from the original on September 29, 2011. Retrieved August 27, 2011. ^ "Voluntary Evacuations in Virginia". NBC. August 25, 2011. Retrieved August 25, 2011. ^ "Hampton Declares State Of Emergency For Hurricane Irene". The City of Hampton. August 25, 2011. Archived from the original on October 1, 2011. Retrieved August 26, 2011. ^ a b c d "State-by-state developments related to Hurricane Irene". CNN. August 25, 2011. Retrieved August 26, 2011. ^ McMichael, William (August 25, 2011). "Ships flee Norfolk as Hurricane Irene nears". Navy Times. Retrieved August 25, 2011. ^ "Maryland Declares A State Of Emergency". WMDT-TV 47. Associated Press. August 25, 2011. Archived from the original on September 28, 2011. Retrieved August 25, 2011. ^ "Ocean City Initiates Phase I of Emergency Plan". Town of Ocean City Maryland. August 25, 2011. Archived from the original on September 13, 2011. Retrieved August 25, 2011. ^ "Student Workers Ordered To Evacuate Ocean City". WMDT-TV 47. August 25, 2011. Archived from the original on September 28, 2011. Retrieved August 25, 2011. ^ Hughes, Ryan (August 25, 2011). "Mandatory Evacuation Declared For Ocean City". WMDT-TV 47. Archived from the original on September 28, 2011. Retrieved August 25, 2011. ^ "Dorchester County Council Issues Hurricane Irene State of Emergency" (PDF). Dorchester County Government. August 25, 2011. Archived from the original (PDF) on September 28, 2011. Retrieved August 25, 2011. ^ "Wicomico County Executive Issues Hurricane Irene State of Emergency". Wicomico County Government. August 25, 2011. Archived from the original on September 27, 2011. Retrieved August 25, 2011. ^ Thomas, Lauren (August 26, 2011). "Phased Evacuation Issued In Somerset County, MD". WMDT-TV 47. Archived from the original on September 28, 2011. Retrieved August 26, 2011. ^ Gilchrist, Lynette (August 26, 2011). "Evacuations Ordered In Parts Of Wicomico County". WMDT-TV 47. Archived from the original on September 28, 2011. Retrieved August 26, 2011. ^ "Local Shelter Information by County". Daily Times. August 26, 2011. Retrieved August 26, 2011. ^ "Evacuations Ordered In Parts Of Atlantic, Cape May And Ocean Counties Ahead Of Hurricane Irene". Philadelphia: KYW-TV. August 25, 2011. Archived from the original on August 26, 2011. Retrieved August 26, 2011. ^ Montgomery, Jeff (August 26, 2011). "Markell orders evacuation of residents along coast". The News Journal. Archived from the original on August 26, 2011. Retrieved August 26, 2011. ^ a b "Irene leaves flooding, wind damage in its path". The News Journal. August 25, 2011. Retrieved August 29, 2011. ^ Weiss. "Storm Prediction Center Tornado Watch 811". Storm Prediction Center. Retrieved August 27, 2011. ^ "Dedication of King memorial postponed due to Irene". CNN. August 25, 2011. Retrieved August 26, 2011. ^ Weiss. "Irene Downgraded To Tropical Storm". MyFoxPhilly. Retrieved August 30, 2011. ^ "Creating Unsurpassed Situational Awareness During Hurricane Irene and Tropical Storm Lee" (PDF). Archived from the original (PDF) on October 21, 2013. Retrieved February 13, 2014. ^ Rubinkam, Michael. "Pa. Gov. Corbett declares state of emergency". WPVI-TV. Retrieved August 27, 2015. ^ "Hurricane Irene continues path towards New York, Philadelphia, Boston and the rest of the Northeast". Times. August 26, 2013. Retrieved October 21, 2013. ^ Schneyer, Joshua; McGurty, Janet. "UPDATE 1-NE energy suppliers brace for disruptions from Irene". Reuters. Archived from the original on August 26, 2011. Retrieved August 26, 2011. ^ Gibson, Ginger (August 25, 2011). "As Hurricane Irene nears, Gov. Christie declares a state of emergency to mobilize National Guard". The Star-Ledger. Retrieved August 25, 2011. ^ Spoto, Mary Ann (August 27, 2011). "President Obama declares state of emergency for N.J." The Star-Ledger. Retrieved August 27, 2011. ^ Watson, Sarah (August 25, 2011). "Cape May County, Atlantic County and Long Beach Island evacuations ordered; coast under hurricane watch". Press of Atlantic City. Retrieved August 25, 2011. ^ "Atlantic City officials urge everyone to get off island as city faces first evacuation in history". Press of Atlantic City. August 26, 2011. Retrieved August 26, 2011. ^ a b James Barron, "New York City Shuts Down Amid Flooding Fears" (August 27, 2011), The New York Times. ^ Weaver, Donna (August 25, 2011). "Mandatory evacuation of Long Beach Island begins at 8 am Friday". Press of Atlantic City. Retrieved August 25, 2011. ^ "NJ Irene Updates: Parkway tolls to be suspended at 8 am Friday to aid evacuations". Asbury Park Press. August 25, 2011. Retrieved August 26, 2011. ^ McCormack, Simon (August 25, 2011). "New York Declares State Of Emergency For Hurricane Irene". The Huffington Post. Retrieved August 25, 2011. ^ "New York City Hurricane Evacuation Zones" (PDF). NYC.gov. Retrieved August 26, 2011. ^ Goldman, Henry (August 25, 2011). "Irene May Require NYC Evacuations". Bloomberg. Retrieved August 25, 2011. ^ "Obama: Emergency for NY as Irene approaches". The Wall Street Journal. Associated Press. August 26, 2011. Retrieved August 28, 2011. ^ "Hurricane Irene Could Shut Down Entire NYC Transit System". WNYW. August 25, 2011. Retrieved August 25, 2011. ^ Jones, Kenneth (August 26, 2011). "UPDATED: Hurricane Irene Prompts Cancellation of All Broadway Shows Aug. 27–28; Off-Broadway Also Impacted". Playbill. Archived from the original on September 13, 2012. Retrieved August 26, 2011. ^ Rossingh, Danielle (August 26, 2011). "National Tennis Center to Close on Eve of U.S. Open; Kids' Day Canceled". Bloomberg L.P. Retrieved August 27, 2011. ^ Kamp, Jon (August 26, 2011). "Massachusetts Governor Declares State Of Emergency Ahead Of Irene". The Wall Street Journal. Dow Jones Newswires. Archived from the original on August 26, 2011. Retrieved August 26, 2011. ^ "Updated forecast for Vermont on Hurricane Irene" (August 26, 2011). Burlington Free Press. ^ J. Hemmerdinger, "Groups prepare to open hurricane shelters" (August 28, 2011). Maine Sunday Telegram. ^ a b c Centre for Research on the Epidemiology of Disasters; Guha-Sapir, D. "EM-DAT: The Emergency Events Database". Université catholique de Louvain. Retrieved April 23, 2019. ^ a b "Millions in Hurricane Irene insurance claims in The Bahamas". Caribbean360. October 7, 2011. Retrieved October 14, 2011. ^ a b Telling the Weather Story (PDF) (Report). Insurance Bureau of Canada. June 4, 2012. Archived from the original (PDF) on November 5, 2012. Retrieved June 4, 2012. ^ "Tropical Storm Irene barrels toward Puerto Rico". Fox News. Associated Press. August 21, 2011. Archived from the original on August 26, 2011. Retrieved August 23, 2011. ^ Staff writer (August 22, 2011). "De fortes pluies orageuses cette nuite". Journal France-Antilles (in French). France Antilles Martinique. Archived from the original on August 26, 2011. Retrieved August 22, 2011. ^ Staff writer (August 22, 2011). "Retour au vert". Journal France-Antilles (in French). France Antilles Guadeloupe. Archived from the original on August 26, 2011. Retrieved August 22, 2011. ^ CMC (August 21, 2011). "Tropical Storm Irene forces LIAT to suspend services in and out of Antigua". Antigua Observer. Observer Publications Limited. Archived from the original on August 26, 2011. Retrieved August 23, 2011. ^ Staff reporter (August 22, 2011). "Irene passes, no major damage reported". Virgin Islands News Online. Archived from the original on August 26, 2011. Retrieved August 22, 2011. ^ CNN Wire Staff (August 22, 2011). "Fire destroys private-island home of Virgin head Richard Branson". CNN. Archived from the original on August 26, 2011. Retrieved August 23, 2011. ^ Newsline 340 (August 25, 2011). "Storm Assessments Show Minimal Damage Sustained From Hurricane Irene". WTJX-TV. Archived from the original on September 14, 2011. Retrieved August 27, 2011. ^ a b Deutsche Presse-Agentur (August 22, 2011). "Huracán "Irene" deja daños a su paso por Puerto Rico". El Regional del Zulia (in Spanish). El Regional del Zulia C.A. Archived from the original on September 28, 2011. Retrieved August 22, 2011. ^ a b Coto, Danica (August 22, 2011). "Hurricane Irene slams Puerto Rico; could hit US". Forbes. Archived from the original on August 27, 2011. Retrieved August 22, 2011. ^ Alvarado, Gerardo (August 22, 2011). "Sin servicio de agua potable más de cien mil abonados". El Nuevo Día (in Spanish). Grupo Ferré-Rangel. Archived from the original on August 27, 2011. Retrieved August 22, 2011. ^ Stewart, Stacy (August 22, 2011). "Hurricane Irene Tropical Cyclone Update". National Hurricane Center. Retrieved August 22, 2011. ^ Roth, David M; Hydrometeorological Prediction Center (August 26, 2011). Hurricane Irene – August 21–24, 2011. United States National Oceanic and Atmospheric Administration's National Weather Service. Retrieved August 26, 2011. ^ Martínez, Andrea (August 22, 2011). "Reporte preliminar de daños en la agricultura". El Nuevo Día. Grupo Ferré-Rangel. Archived from the original on August 27, 2011. Retrieved August 22, 2011. ^ González, Joanisabel (August 23, 2011). "Azote a las siembras en Maunabo y Yabucoa". El Nuevo Día (in Spanish). Grupo Ferré-Rangel. Retrieved August 23, 2011. ^ Cabiya, Yanira H. (August 22, 2011). "Se esperan unas 4 pulgadas más de lluvia en todo Puerto Rico". El Nuevo Día (in Spanish). Grupo Ferré-Rangel. Retrieved August 23, 2011. ^ Staff; AFP (August 23, 2011). "Huracán Irene en Puerto Rico deja al menos un muerto y mil 500 damnificados" (in Spanish). TeleSUR. Archived from the original on August 26, 2011. Retrieved August 24, 2011. ^ Kuilan, Gloria R. (August 25, 2011). "Los daños ascenderían a $500 millones". El Nuevo Día (in Spanish). Grupo Ferré-Rangel. Retrieved August 25, 2011. ^ Sánchez, Israel R. (August 22, 2011). "Un velero hundido y destrozos en residencias deja el huracán Irene en su paso por Culebra". El Nuevo Día (in Spanish). Grupo Ferré-Rangel. Archived from the original on August 27, 2011. Retrieved August 22, 2011. ^ Stewart, Stacy (August 22, 2011). "Tropical Storm Irene Tropical Cyclone Update". National Hurricane Center. Retrieved August 22, 2011. ^ García, Johanna (August 25, 2011). "Desplazados por las lluvias aumentan a 37,743". El Día (in Spanish). Archived from the original on August 26, 2011. Retrieved August 26, 2011. ^ a b Redacción (August 24, 2011). "Hay 31,900 desplazados y 85 comunidades aisladas". Diario @ Diario (in Spanish). Archived from the original on August 26, 2011. Retrieved August 24, 2011. ^ Redacción (August 24, 2011). "Desplazados superan los 12 mil; hay 25 comunidades aisladas". Diario @ Diario (in Spanish). Archived from the original on August 26, 2011. Retrieved August 24, 2011. ^ Gilbert, Manuel; Santana, Ricardo (August 23, 2011). "Irene deja daños en costa norte". Listín Diario. Listín Diario. Archived from the original on August 26, 2011. Retrieved August 24, 2011. ^ Urbáez, Ramón; Thomas, José A.; Corporan, Carlos (August 24, 2011). "Hay tres muertos, 31 mil 900 personas desplazadas y daños diversos por Irene". Almomento.net (in Spanish). Archived from the original on August 26, 2011. Retrieved August 24, 2011. ^ Vega, Manuel A. (August 24, 2011). "Una persona desaparecida y 45 comunidades incomunicadas dejó Irene región Este". Primicias (in Spanish). Archived from the original on August 26, 2011. Retrieved August 25, 2011. ^ "INDRHI reportó Irene dañó 170 tomas". El Nacional. August 26, 2011. Archived from the original on October 2, 2011. Retrieved August 28, 2011. ^ Carabollo, Joaquín (August 29, 2011). "Daños causados por Irene en el país se llevan alrededor de mil millones de pesos". Noticias SIN. Archived from the original on May 8, 2012. Retrieved August 31, 2011. ^ LLM; Staff writer (August 23, 2011). "Irène provoque des inondations dans le Nord Ouest" (in French). Radio Métropole. Archived from the original on August 26, 2011. Retrieved August 26, 2011. ^ a b "Haiti escapes serious damage from Hurricane Irene, UN reports". UN News Centre. August 24, 2011. Archived from the original on August 26, 2011. Retrieved August 25, 2011. ^ Prensa Latina (August 24, 2011). "Hurricane Irene wreaks havoc in Haiti". Ahora. Archived from the original on August 30, 2011. Retrieved August 26, 2011. ^ Agence France-Presse (August 25, 2011). "L'ouragan Irène fait 2 morts en Haïti". Le Figaro (in French). Dassault Group. Retrieved August 26, 2011. ^ González, Rubicel (August 25, 2011). "Irene Does not Leave much Rain in Holguin". ahora.cu. Archived from the original on August 28, 2011. Retrieved August 26, 2011. ^ El Nuevo Herald (August 24, 2011). "Huracán Irene causa daños en Baracoa, Cuba". The Miami Herald (in Spanish). The McClatchy Company. Retrieved August 27, 2011. ^ Fernandez, Irma (August 25, 2011). "Hurricane Irene Update". San Diego Entertainer. Archived from the original on August 26, 2011. Retrieved August 25, 2011. ^ "Irene Weakens to Category 1 Hurricane, But Remains Big Threat to U.S." Fox News Channel. Associated Press. August 23, 2011. Archived from the original on August 26, 2011. Retrieved August 25, 2011. ^ Myers, Gay N. (August 24, 2011). "Irene drenches Turks and Caicos, Bahamas". Travel Weekly. Northstar Travel Media. Retrieved August 27, 2011. ^ Bleiberg, Larry (August 26, 2011). "Hurricane Irene damages Grand Turk cruise port". USA Today. Gannett Company. Retrieved August 27, 2011. ^ Staff reporter (August 26, 2011). "Hurricane Irene: The Bahamas picks up the pieces after devastating storm". International Business Times. The International Business Times Inc. Retrieved August 26, 2011. ^ Robards, Chester (August 25, 2011). "Irene devastates Southeastern Bahamas". The Naussau Guardian. Archived from the original on August 26, 2011. Retrieved August 25, 2011. ^ "Hurricane Irene hammers Bahamas islands". BBC News. August 25, 2011. Archived from the original on August 26, 2011. Retrieved August 25, 2011. ^ a b CNN Wire Staff (August 25, 2011). "'Awesome' hurricane rips through Bahamas' 700 islands". CNN. Archived from the original on August 26, 2011. Retrieved August 25, 2011. ^ Thompson, Taneka (August 27, 2011). "Davis: Irene caused millions of dollars in damage to Cat Island". The Tribune. India. Archived from the original on November 4, 2011. Retrieved August 28, 2011. ^ Staff reporters (August 29, 2011). "Vermont, N.J. rivers still rising even after Irene". MSNBC. Retrieved August 29, 2011. ^ Masters, Jeffrey. "Irene's 1-in-100 year rains trigger deadly flooding". Weather Underground. Jeff Masters' WunderBlog. Retrieved September 14, 2011. ^ Jonsson, Patrik (September 14, 2011). "Aftermath of Irene: budget-straining cleanup and lives 'turned upside down'". The Christian Science Monitor. Retrieved August 29, 2011. ^ a b c d e f g h WPVI-TV, DT (August 31, 2011). "The 44 victims of Hurricane Irene". 6ABC. Retrieved September 14, 2011. ^ Staff writer (August 28, 2011). "Irene kills at least 21 people". News1130. Rogers Communications. Archived from the original on April 5, 2012. Retrieved August 29, 2011. ^ a b c d Glazer, Glenn (August 25, 2011). "Scattered rain, wind gusts hit South Florida as Irene plows through Bahamas". WPTV-TV. Archived from the original on August 26, 2011. Retrieved August 25, 2011. ^ Axelbank, Evan (August 26, 2011). "Eight people injured by Irene's waves after being swept off a Boynton Beach jetty". WPTV. Archived from the original on September 28, 2011. Retrieved August 27, 2011. ^ Weiner, Jeff (August 27, 2011). "Hurricane Irene's rough surf kills two off Florida coast, officials say". Orlando Sentinel. Retrieved August 27, 2011. ^ Kleinberg, Eliot (August 25, 2011). "Scattered rain, 51-mph wind gusts hit South Florida as Irene slams Bahamas, aims at Carolinas". The Palm Beach Post. Archived from the original on August 26, 2011. Retrieved August 25, 2011. ^ "History for Melbourne, FL". Weather Underground. August 26, 2011. Retrieved August 27, 2011. ^ a b Peterson, Bo; Smith, Glenn (August 26, 2011). "Forecasters: Worst of Irene moving through Lowcountry now". The Post and Courier. Evening Post Publishing Company. Retrieved August 26, 2011. ^ Smith, Bruce (August 26, 2011). "Rain from Irene falling on S.C. coast". The Anderson Independent-Mail. Independent Publishing Company. Associated Press. Archived from the original on May 18, 2013. Retrieved August 26, 2011. ^ Weiss, Mitch (August 26, 2011). "Hurricane Irene brings rain, heavy seas to coast". The Boston Globe. Associated Press. Retrieved August 26, 2011. ^ Beven, Jack (August 27, 2011). "Hurricane Irene Intermediate Advisory Twenty-Seven A". National Hurricane Center. Retrieved August 27, 2011. ^ Masters, Jeff (August 28, 2011). "Irene sends 4.5-foot storm surge up Chesapeake Bay". Weather Underground. Retrieved August 28, 2011. ^ a b WSOC-TV (August 27, 2011). "Irene devastates NC coast claiming multiple lives". Cox Enterprises. Archived from the original on November 4, 2011. Retrieved August 28, 2011. ^ WNCT (August 27, 2011). "Tornado confirmed in Tyrell County". Eyewitness News. Archived from the original on November 5, 2011. Retrieved August 28, 2011. ^ "Hurricane Irene batters N.C., killing 1". MSNBC. August 27, 2011. Retrieved August 27, 2011. ^ Zucchino, David; Fausset, Richard (August 27, 2011). "Hurricane Irene: First two deaths from storm are reported". Los Angeles Times. Retrieved August 27, 2011. ^ Jarvis, Craig; Siceloff, Bruce (August 31, 2011). "After the winds and floods, Irene's massive toll rolls in". News & Observer. Archived from the original on October 6, 2013. Retrieved October 27, 2011. ^ Fernandes, Deirdre (October 10, 2011). "N.C. 12 has opened, restoring traffic to Hatteras Island". The Virginian-Pilot. Norfolk, Virginia. Retrieved October 11, 2011. ^ Hixenbaugh, Mike (August 27, 2011). "Tornado rips through Sandbridge, damages homes". The Virginian-Pilot. Retrieved August 27, 2011. ^ "Six dead as Hurricane Irene edges into Virginia". MSNBC. August 27, 2011. Retrieved August 27, 2011. ^ Dujardin, Peter (August 28, 2011). "Mother took spot close to window before son killed by crashing tree". Daily Press. Retrieved November 1, 2011. ^ "About 500,000 customers in mid-Atlantic lack power". Salisbury, Maryland: WMDT-TV. August 29, 2011. Archived from the original on January 16, 2014. Retrieved September 6, 2011. ^ "Nearly 1 Million Lose Power in Mid-Atlantic". Salisbury, Maryland: WBOC. August 28, 2011. Retrieved September 6, 2011. ^ "The Water Damage Restoration project in Maryland". The Water restoration group in MD. December 2, 2011. ^ "Irene Damage Forces Md. Hospital Evacuation". Salisbury, Maryland: WBOC. August 28, 2011. Retrieved September 6, 2011. ^ Rosenthal, Brian (August 28, 2011). "Hurricane Irene aftermath: Dispatches from Virginia, Maryland, Delaware and the District". The Washington Post. Retrieved September 6, 2011. ^ "Hurricane Irene Takes A Toll On Maryland Crops". Salisbury, Maryland: WMDT-TV. August 30, 2011. Archived from the original on September 28, 2011. Retrieved September 6, 2011. ^ The News Journal (August 29, 2011). "Bodies of missing men found". DelawareOnline. Retrieved September 6, 2011. ^ "IRENE: NWS says tornado hit near Lewes with 95 mph winds". Salisbury, Maryland: DelmarvaNow.com. August 31, 2011. Archived from the original on September 23, 2015. Retrieved September 6, 2011. ^ The News Journal (August 29, 2011). "Updated rainfall totals". DelawareOnline. Retrieved September 6, 2011. ^ "Sussex County Assesses Damage in Wake of Irene". Salisbury, MD: WBOC-TV. August 28, 2011. Retrieved September 20, 2017. ^ "Hurricane Irene Philadelphia: Hundreds of Thousands Without Power". International Business Times. August 29, 2011. Retrieved September 6, 2011. ^ Scully, Paula (August 30, 2011). "Town near Irene's eye eludes disaster". Asbury Park Press. Retrieved September 1, 2011. ^ Sterling, Steven. "Hurricane Irene leads to historic flooding after month's record rainfall". The Star-Ledger. NJ.com. Retrieved August 29, 2011. ^ Hutchins, Ryan. "Fairfield closed off to non-residents after Passaic River overflows into township". The Star-Ledger. NJ.com. Retrieved August 29, 2011. ^ Sterling, Steven. "N.J. rainfall map – storm totals from Hurricane Irene". The Star-Ledger. NJ.com. Retrieved August 29, 2011. ^ Frassinelli, Mike. "Hurricane Irene wreaks havoc on New Jersey highways". The Star-Ledger. NJ.com. Retrieved August 20, 2011. ^ Krudy, Edward Krudy (August 28, 2011). "Jersey City, a satellite for Wall St, hit by floods". Reuters. Retrieved September 15, 2011. ^ a b "PORT AUTHORITY REOPENS NORTH TUBE OF THE HOLLAND TUNNEL" (Press release). Port Authority of New York and New Jersey. August 28, 2011. Retrieved February 14, 2014. ^ Karas, David. "Flooding from Hurricane Irene inundates tracks at Trenton Transit Center (with video)". The Times of Trenton - NJ.com. Retrieved August 29, 2011. ^ Rouse, Karen (September 14, 2011). "Hurricane Irene cost NJ Transit $10 million, official says". The Record. Archived from the original on June 23, 2012. Retrieved September 16, 2011. ^ National Climatic Data Center (2011). "Event Report for New Jersey". Retrieved February 18, 2012. ^ Spoto, MaryAnn; Considine, Bob (September 2, 2011), "Gov. Chris Christie bears down on power companies to relight rest of N.J.", The Star Ledger, retrieved September 3, 2011, Some 560,000 JCP&L customers lost power from the storm. Power had been restored by yesterday to all but 750 of the approximately 800,000 PSE&G customers affected by Irene. ^ Grynbaum, Michael (August 30, 2011). "Water Still Rises in New Jersey and Connecticut". The New York Times. Retrieved August 31, 2011. ^ Star Ledger Staff (August 30, 2011). "3 days after Hurricane Irene hits, floodwaters continue to destroy homes, close roads". The Star-Ledger. Retrieved August 31, 2011. ^ a b Benkoe, Jeff (August 28, 2011). "Long Island pounded by Irene but residents feel lucky". Reuters. Retrieved September 14, 2011. ^ Jonathan Allen – "Long Island residents frustrated by power outages" – Reuters – August 29, 2011 – Retrieved August 30, 2011. ^ "NJ TRANSIT Service Information for Tuesday, August 30". NJ Transit. August 29, 2011. Retrieved September 14, 2011. ^ Moses, Robert (November 23, 2011). "Metro North Port Jervis Line Set to Resume Service". Retrieved November 24, 2011. ^ Bosch, Adam (September 8, 2011). "Sewage plants no match for Irene, authorities say". Times-Herald Record. Retrieved September 14, 2011. ^ Sullivan, John (September 8, 2011). "Raw sewage worried rescuers in Goshen". Times-Herald Record. Retrieved February 14, 2014. ^ Sullivan, John (September 2, 2011). "Hundreds in Washingtonville displaced by Irene". Times-Herald Record. Retrieved September 14, 2011. ^ Kinsman, Kat (September 14, 2011). "Amid devastating New York flooding, a stream of information". Cable Network News. Retrieved August 29, 2011. ^ Eckholm, Erik (August 31, 2011). "Covered Bridges, Beloved Remnants of Another Era, Were Casualties, Too". The New York Times. Retrieved September 14, 2011. ^ Dean, Josh (August 19, 2012). "Please God Stop the Rain". New York Magazine. ^ "Photo of Hylan Boulevard in Prattsville". Times Union. September 1, 2011. Retrieved September 14, 2012. ^ "Photo of across Main Street from the Morses". Times Union. September 1, 2011. Retrieved September 14, 2012. ^ Vielkind, Jimmy (September 1, 2011). "'We thought we were going to die'". Times Union. Retrieved September 14, 2012. ^ Waldman, Scott (September 10, 2011). "Survival is town's greatest test". Times Union. Retrieved September 14, 2012. ^ Rubin, Alissa J. (August 31, 2011). "In the Adirondacks, Storm-Battered and Cut Off". The New York Times. Retrieved September 14, 2011. ^ "Adirondack Trail Information". New York State Department of Environmental Conservation. Retrieved September 14, 2011. ^ a b Baker, Al (September 3, 2011). "Amid Mud and Floods, Push to Restore Power". The New York Times. Retrieved September 14, 2011. ^ Sunkin, Alyssa (September 4, 2011). "Acres of crops got washed away". Times-Herald Record. Retrieved February 14, 2014. ^ Gibson, Megan (September 20, 2011). "The Great Pumpkin Shortage: Stormy Summer Limits Supply In Northeast". Time. Retrieved February 18, 2012. ^ "Warwick Farm Aid Sept. 25, 2011". 2011. Retrieved September 19, 2011. ^ Horrigan, Jeremiah (September 19, 2011). "Farmers despairing over monumental losses of crops". Times-Herald Record. Retrieved September 19, 2011. ^ Horrigan, Jeremiah (September 19, 2011). "Not all farmers done in by floods". Times-Herald Record. Retrieved September 19, 2011. ^ "754,000 Homes Without Power, Flooding Concerns Rise In Irene's Wake", The Hartford Courant, August 28, 2011. ^ "Irene knocks out power, downs trees on approach". WTNH-TV. August 28, 2011. Archived from the original on September 18, 2011. Retrieved September 1, 2011. ^ "Hurricane Irene: Connecticut governor confirms 10th death". Los Angeles Times. August 28, 2011. Retrieved September 14, 2011. ^ "Hurricane Irene: Connecticut sizes up the damage from Irene". abclocal.go.com/wabc/. ABC News. Retrieved September 14, 2011. ^ Secret, Mosi (September 2, 2011). "Nearly Week Later, Thousands in Region Still Lack Clean Water". The New York Times. Retrieved September 14, 2011. ^ Bent, G.C., L. Medalie, and M.G. Nielsen. (2013). High-Water Marks from Tropical Storm Irene for Selected River Reaches in Northwestern Massachusetts, August 2011. Reston, Va.: U.S. Department of the Interior, U.S. Geological Survey. ^ Daniels, Tammy (December 15, 2011). "Hurricane-Damaged Route 2 Reopens to Traffic". iBerkshires.com. Retrieved October 6, 2014. ^ "Huntington Chief: Becket dam didn't fail". WWLP. August 28, 2011. Archived from the original on November 15, 2012. Retrieved September 14, 2011. ^ "Irene delivers glancing blow to R.I."
^ "Irene leaves up to half of Rhode Island without power". USA Today. August 28, 2011. ^ "Utilities push to restore power after brush with Hurricane Irene". August 30, 2011. Archived from the original on January 11, 2012. Retrieved August 30, 2011. ^ "Aerial tour of Aquidneck Island outages". WPRI. August 28, 2011. Archived from the original on April 5, 2012. Retrieved September 17, 2011. ^ "Hurricane Irene". Archived from the original on January 19, 2012. ^ "Irene inundates Vermont, washing out bridges, killing one". CNN. August 31, 2011. Retrieved August 29, 2011. ^ "Vt. communities inundated by Irene flooding". Vermont: WCAX. August 28, 2011. Archived from the original on August 28, 2011. Retrieved September 14, 2011. ^ Hallenbeck, Terri (August 30, 2011). "Vermont's covered bridges take a hit from Irene". Burlington Free Press. Archived from the original on July 29, 2012. Retrieved September 14, 2011. ^ Gast, Phil (September 1, 2011). "Crews reach far corners of Vermont cut off by Irene". CNN. Retrieved September 14, 2011. ^ Pollak, Sally (September 15, 2011). "Phish jams for flood relief in Vermont". Burlington Free Press. Retrieved October 7, 2011. ^ Hallenbeck, Brent (October 6, 2011). "Grace Potter to hold two flood relief benefits". Burlington Free Press. Retrieved October 7, 2011. ^ Schwartz, John (December 6, 2011). "Vermont Rebounding Quickly From Hurricane Irene". The New York Times. Retrieved December 6, 2011. ^ "Irene Graphics Archive". National Hurricane Center. August 29, 2011. Retrieved November 1, 2011. ^ Bryant, Ann (August 30, 2011). "Carrabassett Valley deals with aftermath of Hurricane Irene". Sun Journal. Retrieved November 1, 2011. ^ "Irene drenches Quebec, Maritimes". CBC News. August 28, 2011. Retrieved September 14, 2011. ^ "Irene balaie le Québec, 250 000 foyers privés d'électricité" [Irene batters Quebec; 250,000 left without power]. La Presse (in French). Montreal. August 28, 2011. Retrieved September 14, 2011. ^ "Irene leaves a mark on Quebec". CBC News. August 29, 2011. Retrieved September 14, 2011. ^ "Irene" retired from list of Atlantic Basin storm names (Report). National Oceanic and Atmospheric Administration. April 13, 2012. Retrieved April 13, 2012. Wikimedia Commons has media related to Hurricane Irene (2011). This page was last edited on 17 April 2019, at 03:46 (UTC).